Demographics and family makeup has diversified so greatly that courts are taking notice of outdated laws. Recently, a DuPage County judge ruled on the constitutionality of the current Illinois law that enables courts to order non-married or divorced parents to financially contribute to adult children’s college expenses. The judge’s ruling pointed out that two-parent married families comprise less than 50%, and in 2014, unmarried women accounted for 40% of the U.S. birthrate. In 2011, the divorce rate was 46%. The judge ruled that the law regarding college expenses was unconstitutional, by placing adult children into two classes: those with married parents and those without. It also treats parents differently, based upon their marital status. To read our recent blog post on this topic, click here. Note: This case follows similar rulings from other states and is currently under appeal. 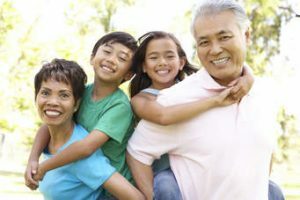 So, it comes as no surprise that the individuals who primarily raise, care for, and financially provide for children today are not always both of the child’s biological parents. However, when a conflict arises between a parent and a non-parent regarding a child’s upbringing (as to decision-making authority, previously called legal custody) and where the child spends time (previously referred to as residential custody/visitation, now called parenting time), courts often have to consider all of the evidence on a case-by-case basis to determine what’s in the child’s best interests. In the recent case of Young v. Herman, a paternal grandmother and her husband filed a petition to establish custody (parental responsibilities) of an 8-year-old grandchild, claiming the child had been primarily in their care since the child was an infant, until the child’s biological mother recently removed the child from their care. The mother filed a motion to have the grandmother’s petition dismissed on the basis that the child was in the mother’s physical custody when the grandmother filed her petition, and therefore lacked standing under the law. The relevant law is section 601.2(b)(3) of the Illinois Marriage and Dissolution of Marriage Act, which states: “A proceeding for allocation of parental responsibilities with respect to a child is commenced in the court: by a person other than a parent, by filing a petition for allocation of parental responsibilities in the county in which the child is permanently resident or found, but only if he or she is not in the physical custody of one of his or her parents[. ]” The mother contended that because she had taken the child back into her care, she had physical custody of the child, and so the grandmother lacked standing to file her petition. Standing is a legal concept, and it traditionally refers to whether a party to a case has “some injury in fact to a legally cognizable interest.” See Glisson v. City of Marion. This doctrine of standing “assures that issues are raised only by those parties with a real interest in the outcome of the controversy.” In most lawsuits, the defendant may argue the affirmative defense that the plaintiff lacks standing to bring the case and has the burden to plead and prove this argument. However, the Young v. Herman, court noted that “traditional notions of ‘standing’ do not apply to proceedings under section 601.2 of the Dissolution Act … Instead, the limitation is a statutory threshold restricting a trial court’s authority to address a petition for allocation of parental responsibilities. A petitioner under section 601.2(b)(3) must plead as an element of a petition for allocation of parental responsibilities that this threshold has been crossed, and then the petitioner must prove it at trial.” The burden is on the party who filed the petition (in this case, the grandmother), rather than the other party. The Young v. Herman court ruled that the grandmother’s lack of physical custody was not an issue of standing. The evidence showed that the mother removed the child from the grandparents’ custody just a brief period before the grandmother filed her petition. Simply because the mother yanked the child from the grandmother’s care did not mean that the mother had “physical custody” of the child. So the grandmother was not prohibited from filing her petition for a lack of standing. This logically follows, because if a parent can take a child from the home where she has primarily been raised, eliminating standing for that third-party non-parent who has primarily cared for a child, this would cause severe ramifications. The court also noted that determining “physical custody” of a child is not so easy and does not necessarily translate to physical possession of the child, particularly at the time a case is filed. Ultimately, the court awarded the grandmother primary decision-making for the child and granted the mother parenting time on alternating weekends and one weeknight per week. In making its determination, the court found that the mother “voluntarily relinquished her parenting responsibilities” to the grandmother in the spring of 2007, and the grandmother had been the child’s primary caretaker regarding medical care, education, spiritual life, and activities for nearly 8 years. The mother appealed, but the Appellate Court for the Fourth District upheld the trial court’s ruling. If you are a non-parent raising a child and have questions about establishing your rights, please contact us for a free consultation.